You guys, I’ve eaten so many sweet potatoes in the last few weeks that I might be turning orange. I know this happens with carrots. In fact my dad, when he was a youth, ate so many carrots every day for lunch that his skin did, in fact, generate an orange-y hue for a short time (or so my mother says, anyway). And now I fear the same fate for my own skin. And it’s not that self-tanning orange glow we’re going for — it’s like Violet Beauregarde, but as an orange instead of a blueberry. Well just stop eating sweet potatoes, you say, and I laugh and laugh. 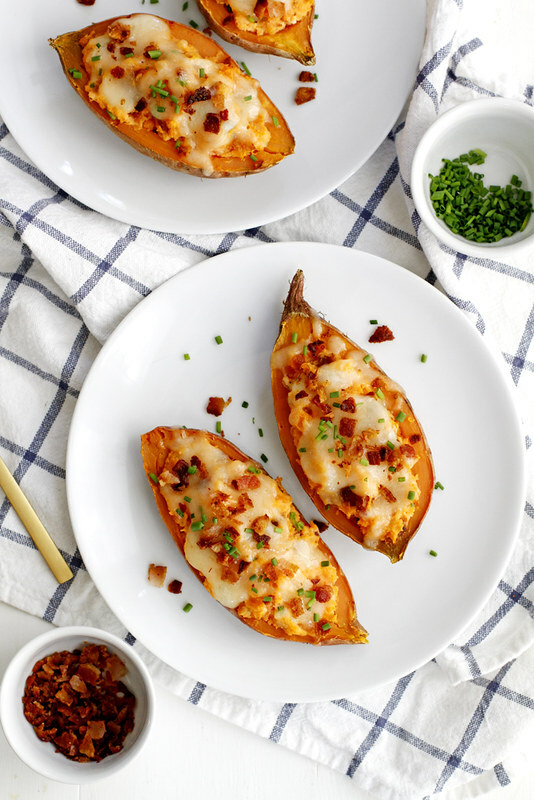 I laugh because will you just look at these bacon, chive and sour cream stuffed sweet potatoes above? Topped with melty cheese and even more bacon? Ah, yes. I see you’re laughing now, too. Soon you’ll also be worrying about orange skin. It’s funny, because two years ago if you’d asked me to even look at a sweet potato I would have gagged — and that is because I was pregnant and anything of the sweet potato or squash variety very quickly became an aversion/a huge NO CAN DO. It was sad, really, because it was fall, and all I wanted was my mom’s sweet potato casserole or a baked sweet potato single lady dinner when my husband was working late but I just. could. not. Fast forward to today, when I am very much not pregnant and in turn, very much craving all of the sweet potatoes, and I think my body is making up for lost time. Of course, I’m not mad about it; but the whole regular baked sweet potato thing was getting a little old. 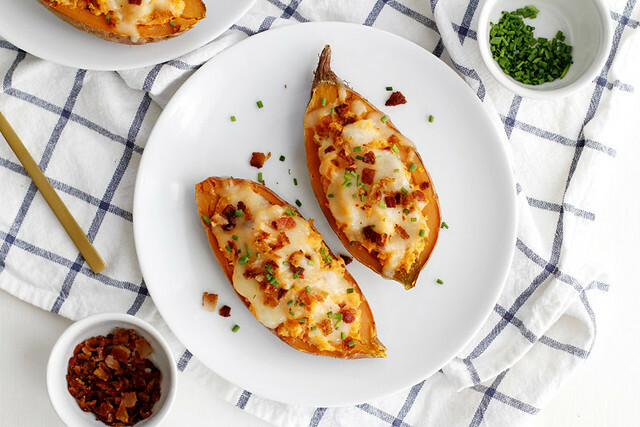 So I jazzed up my routine by twice baking my sweet potato, filling it with cool sour cream and crumbled crispy bacon and chopped chives and then topping it with shredded Monterey Jack cheese that gets all gloriously melty in the oven. Then I topped it with even more bacon and chives (and maybe a little dollop of extra sour cream, too, who can say). And then I ate it. And then another one. And another. And — well, you follow. These taters sufficed for me as a meal in themselves, but they also make for an excellent (and easy!) appetizer for a fall dinner party, or even as a midday snack you just grab and eat straight from the fridge. Since there’s no end in sight to my sweet potato eating, I’m planning to make all of the above happen multiple times this season. I won’t tell you what to do, but I do highly recommend that any or all sweet potato eating you yourself do this season be done in this fashion, and with this recipe. Now, what color shirt do you think matches with orange skin? Heat oven to 400 degrees F. Line a baking sheet with foil. Poke sweet potatoes all over with a fork, then place on prepared baking sheet. Bake sweet potatoes 1 hour until soft and baked through. Set aside until cool enough to handle. Cut cooled sweet potatoes in half lengthwise, then use a spoon to scoop out pulp, leaving a 1/4-inch wall. 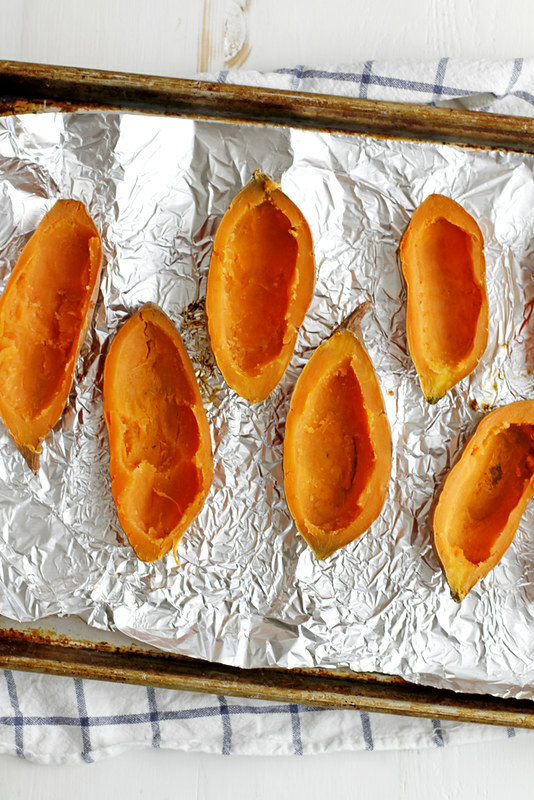 Transfer pulp to a large bowl, and return sweet potato shells to baking sheet. Crumble 4 slices cooked bacon and add to bowl. Add sour cream and 1 tablespoon chopped chives. Stir to combine. Spoon filling into shells. Sprinkle tops with shredded cheese. Bake at 400 degrees F 5 to 10 minutes until cheese is melted. Top with remaining 2 slices bacon, crumbled, and remaining 1 tablespoon chopped chives. I love baked potatoes, they can be used for so many different dishes! These sweet taters just might be worth an orange hue. Lord knows my summer tan is already faded. I’ll just consider this my fall shade. Sounds like heaven on a potato!! They freeze well too! Definitely choose a nice sky blue to go with that orange. It’s a winner every time 🙂 How can you go wrong with bacon and cheese? Hahha I’m thinking a navy shirt will rock with the orange skin? Lol! I will gladly risk orange skin for these babies. Bring it on! These look so good! Sweet and salt is my thing, so I bet these are just my style! Alex gags whenever I make sweet potatoes. Hoping he outgrows that soon. LOVE these baked potatoes! 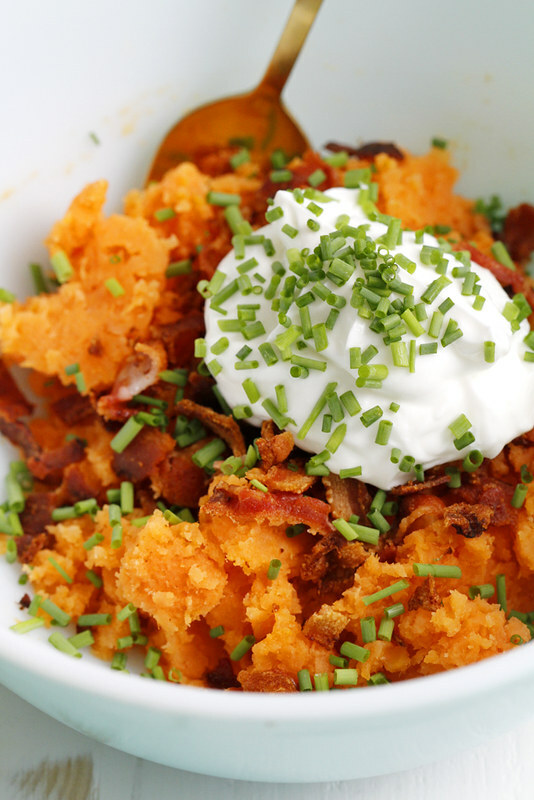 The only thing better than a twice baked potato is a twice baked SWEET potato with savory bacon! You can’t have enough sweet potatoes! 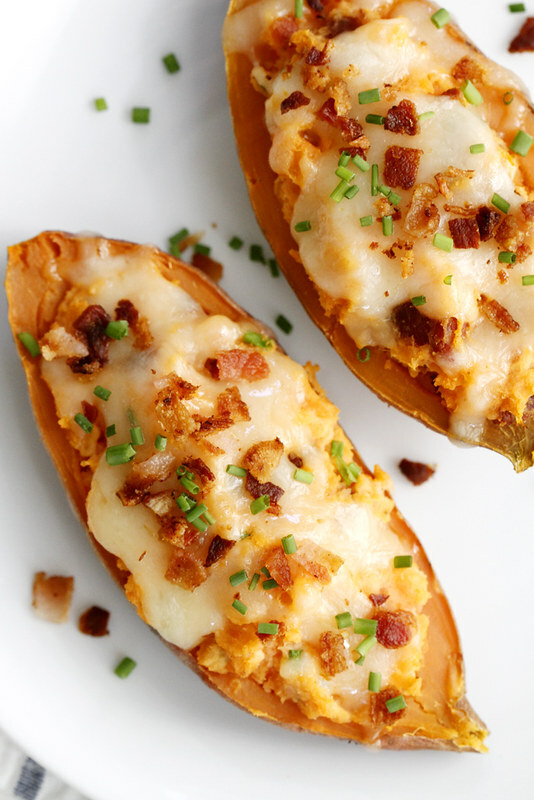 These twice baked sweet potatoes need to happen asap! 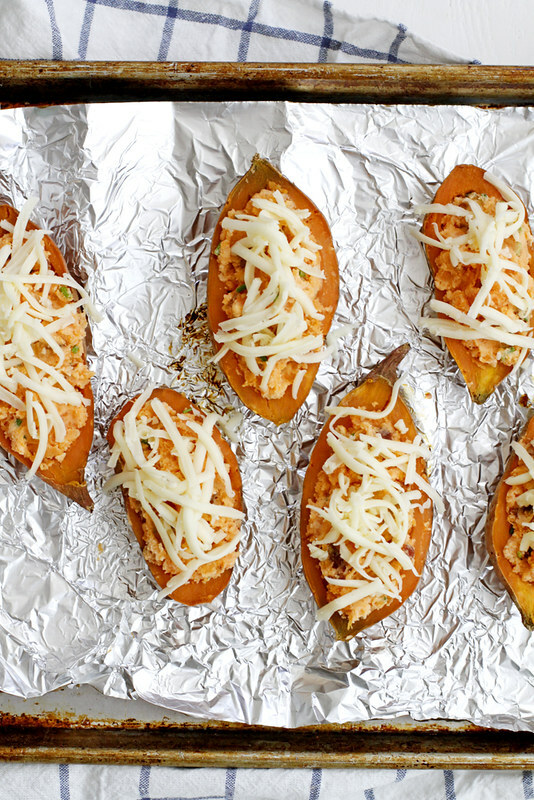 Double baked sweet potatoes sound like the best kind of sweet potatoes. My skin might start to turn orange now too. Rami — They are two different things, though I’m fairly certain they have a similar flavor. All I can say about these is – yum! I love twice baked potatoes at the best of times but using sweet potatoes just takes them over the top delicious. Definitely making these asap. it’s veruca salt, not violet beauregard. two different books.